We love the Llama Llama books, so I hope we win. Great blog. I love how you included a llama craft. We are looking forward to reading the new Llama book! My daughter loves the series; I had no idea there was a new one. Cute craft. My daughter loves these books - something about them makes her giggle every time! Thanks for the chance to win! What a sweet book, thanks! I love children's books and this one looks and sounds so cute. I'd love to win it. thanks for the chance. We llove llove llama llamas at my house! We even "know" some that we feed carrots to on the weekends! Thanks for the chance to win the latest in one of our favorite series! 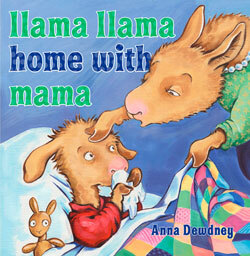 We LOVE Llama Llama books! We have three but not this one - we'd be excited to win this one. :) Thanks for hosting! My grandson would really enjoy a book like this and would love the stuffed llama. I would love to win the book and stuffed animal for my grandson. We love the baby Llama storys and all that llama drama. I am always looking for super cute books to read to my daughter...especially when she is sick. We love Llama Llama books!! We love the Llama Llama books, and this one sounds wonderful too. I love how expressive the books are! I have wanted to read my kids the llama books but they have been checked out at the library. I would love to win! Love the illustration! Need to get some of those for my niece. I love Llama Llama books and I can't wait to read the newest one. This is my favorite favorite series!!!! My grandson loves the other books in the Llama Llama series and I'm sure he would love this one as well. Thank you for the chance to win. 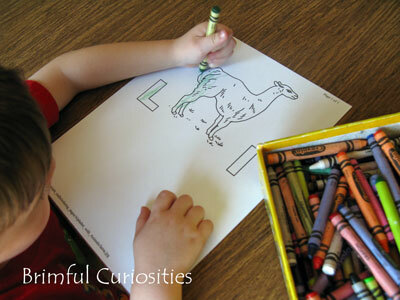 I think your llama llama clothespin craft is really cute and may have to borrow your idea for my grandson - he enjoys craft projects. I follow you on Twitter (cspring31971) and I tweeted. We've enjoyed some of the Llama series as my daugter gets older (now 5). Although the illustrations are just adorable and make you want to read to toddlers, I would reccomend the concepts for kids ages 4-6! We would LOVE to win this prize pack!!! I love the clothespin legs you put on your llama! They're so cute, and a great way to make animal drawings into 3D toys. all of the llama books look so cute!! Thank you for the contest!! This sounds like a wonderful book to read to little ones. Thanks. 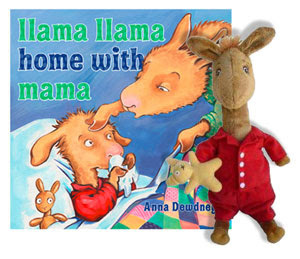 My daughter loves Llama Llama Red Pajama, so she'd love this book and the plush toy as well. My daughter and I have read a few of the books in this series and they are so much fun. We enjoy the rhyming and stories. 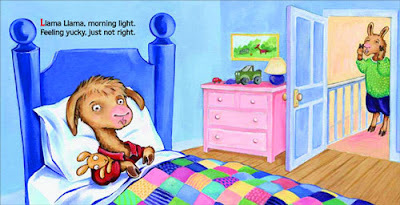 I have never read a Llama Llama book, but they look adorable. I would love to read them with my daughter. Thanks for the giveaway! I am a graduate student, and found your link via pinterest. I am using your activity for one of my assignments, but am going to modify it a bit by having my students write a rhyming word from the Red Pajama book on each clothespin leg. Thank you for the idea!! !